Complex, moral, gracious, and fiercely loyal, Commissario Guido Brunetti is a husband, father, detective, and, above all, a proud resident of the enchanted floating city of Venice. But when Brunetti's old friend, Brett Lynch, an American expatriate-and distinguished art historian-is horribly beaten by thugs in the apartment she shares with her lover, the commanding and strong-willed opera diva Flavia Petrelli, the detective embarks upon an investigation that will lead him deep into the underworld of his beautiful city, where crooked deals and stolen antiquities abound and petty crooks and distinguished citizens alike operate under their own inscrutable rules and baroque code of ethics. But in a city where everybody knows everybody else's business, it's hard to keep secrets for very long. Although Brunetti's trusted sources offer him valuable insights, Venice's shadowy, secretive antiquities market proves more difficult to infiltrate than the detective imagined, and he soon finds himself with a handful of half-clues and scraps of scattered evidence. Brunetti has other problems, as well: for one, he's locked in a delicate and potentially troublesome power struggle with his social-climbing boss, Vice-Questore Patta, who both resents Brunetti and relies on him to solve the city's most high-profile cases. Meanwhile, Venice has entered its rainy season, and the detective finds himself battling sheets of driving rain, and trying to chase down information about Brett's attackers proves to be almost as elusive as sunlight. Still, after a man's body is discovered, it's up to Brunetti to figure out what a murder victim, an antiques dealer, a stranger with Mafia connections, and a group of forged Chinese antiquities all have to do with one another. Suddenly, everything and everyone Brunetti thought he trusted-his sources, Brett, Flavia, even his own family-become objects of his suspicions. Is Brett hiding something from Brunetti that he needs to know to conduct his investigation? Is Flavia telling him the truth? Or is Brunetti becoming paranoid himself? 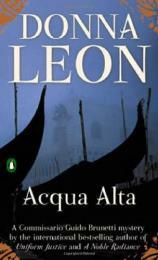 Full of corkscrew plot twists and sharp, pithy observations about family, nationality, and honor, Donna Leon's Acqua Alta takes us into a singular and unforgettable world of beauty, tradition, and greed, where everyone has a secret of their own, and nothing-and no one-is as it seems.